Working with our strategic partner, Inmarsat Government, Digisat provides High Security Wireless IP Network Access Services to the most secure Government Communications Network on the planet. Digisat delivers the best worldwide Red and Black Gateway Services around the globe, with the most comprehensive and far reaching network coverage areas. As a small business, Digisat opens the door for our Government and Military Network Operators to procure these Special Governmental Services and Private Wireless Network Access solutions that deliver cost effective communications solutions to all Military and Government clients. We provide secure connections directly to your organization’s routing point, which allows users to transmit highly secure, sensitive information and data over unclassified and classified wireless networks. Our VIP, Military and Government users can utilize private and completely secure IP addresses to transmit and receive digital data originating from Private Networks, metropolitan data centers and remote locations around the world. 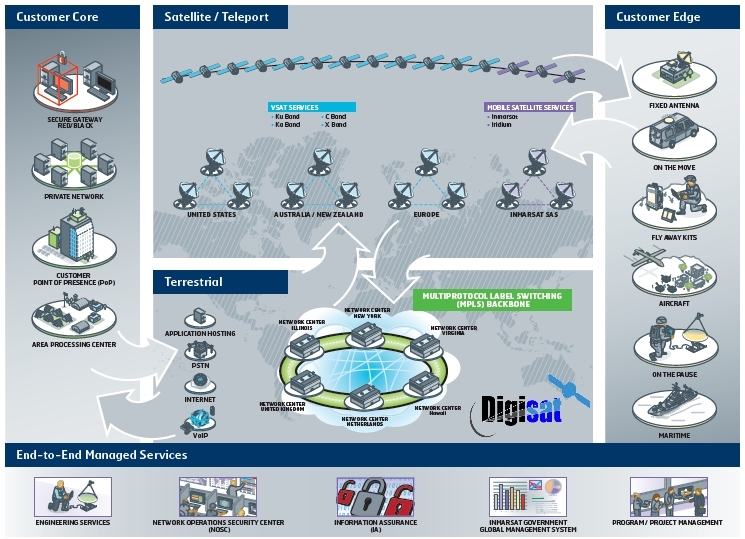 Digisat’s Area Processing Center connects directly to Regional Processing Centers which deliver Centralized and Managed Network IP and Data Services. Digisat’s Global Network Services facilitates Wireless and Wired Communication to and from Customer’s POP’s physically located within an organization, ISP or Colocation Center. For all of your Wireless and Wired Customer Core and Customer Edge Network Services, Digisat is ready to provide a complete, total turnkey solution with all inclusive network connectivity access services for your challenging and Secure IP Communications requirements. We can also supply all required satellite bandwidth! Digisat’s highly skilled Network Administrators, Field Service Engineers, Wireless Cyber Security Professionals and Satcom VSAT Network Technicians deliver the most knowledgeable and Professional Support Personnel Services available on the planet. We support all Terrestrial Network Interfaces, Wireless and Satellite Communications Technologies from L-Band to Ka-Band, Maritime, Aviation and beyond. Total Turnkey Services support all requirements from short term deployments to long term in-theater Technical Network Support Services. Our Technical Support Personnel enable and empower the most highly secure Satellite Communications Protocols, Terrestrial Network Infrastructure Installation and Support Services, Equipment Installation Technicians, Cyber Security Management Professionals, System and Network Administrators, and Ongoing Life Cycle Support Representatives available anywhere on the market today. Digisat is a Total Small Business Entity with access to a myriad of contract vehicles through Inmarsat Government and our other strategic partners. Please contact us today for more information on our comprehensive portfolio of Military and Government Network Communications Services, Solutions and Total Support. From land based Satellite Earth Stations and Satcom on the move Terminals, to Maritime Vessel Broadband Communications and Flyaway VSAT antennas, Digisat is ready to deliver a total turnkey Network Communication Solution for your most challenging Mission Critical and Global Communications requirements.